Turns out, when I booked our flight, we only got a weeks care hire, not three…I didn’t notice this until after the confirmation (a major panic at the time, as I thought I’d only booked the flights for a week and not three!). Realising what had happened we called Virgin who wanted a ridiculous amount of money to amend the booking, and it was cheaper for us to hire elsewhere. We went through USRentACar and hired a car for the final two weeks of our holiday. This meant of course, we would have to change cars partway through our holiday, so today, we went back to MCO to drop the car back to Alamo and pick up the other car from Budget. It was easy and painless. We just followed the signs to the car hire drop off, they scanned a bar code on the windscreen and gave us a receipt. We then walked to Budget and picked up our next car. We *should* have gone back into the airport, but the guy was kind enough to process everything at the desk in the car park. With Alamo we could choose a car; with Budget we were assigned a car. I didn’t like it at all! It was garganutan and fugly! So I asked if there was anything else available, which there was – a Chevrolet Impala and a lovely drive it was too! Now, before all this car swapping lark, we had breakfast at Cracker Barrel. Another massive menu – just for breakfast – it was mind boggling! But eventually we all picked what to have. Steve had a breakfast platter with eggs, hashbrowns, grits, biscuits and sausage patties. The total bill was $31.36, plus tip. We enjoyed the breakfast and the portions weren’t overly huge, so if you’re looking to stuff yourself silly for the rest of the day you won’t find it here! The menu is humungous though, and it was hard to make a choice! I loved the bric-a-brac on the walls and the general old timey America feel of the place and the general store that was attached to it. We plan to go back for dinner at some point… but the future tells you that we didn’t. So, breakfast eaten and car swapped we made our way to our first Disney park – Hollywood Studios! We arrived around 1:30ish and paid the $14 car parking before being well guided to our car parking spot in the Music lot, row 53. We walked to the end of the aisle to catch the tram to the park entrance. I clocked the Guest Services and said “ooh, ooh! 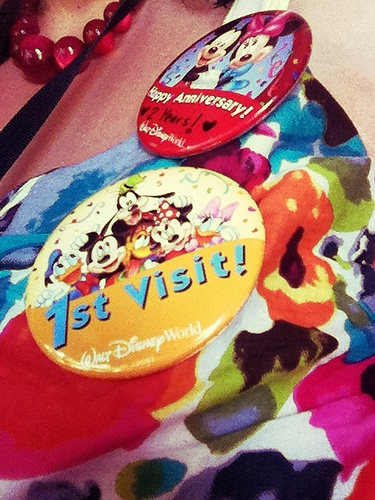 We must get our first visit badges!” and whilst a couple of days out, we also asked for anniversary badges too. I was kinda bummed that our anniversary at Paradiso 37 had been overlooked (despite us telling them) and wanted a badge. The CM asked how many years and wrote ♥ 2 years! ♥ on them, which I thought was really cute. With our badges proudly pinned – it was lovely to be wished ‘Happy Anniversary’ as we walked around the park – and park maps grabbed we started to make a plan of action for the day. … we walked round to the Indiana Jones Epic Stunt Spectacular which was impressive to watch and we all enjoyed it. We then made our way towards Star Tours, only to notice that the Pixar Pals Countdown to Fun! was starting shortly, so decided to hang about for that to get a good spot to see the parade. We bought an ice-cream to help pass the time. I got my frozen banana that I remember reading about years ago on a Disney forum when I had my first trip for 2003 planned. It was yummy! At this point, Liam decided to have a bit of a strop, but when the characters came out, he cheered up and loved watching the parade – he even said how he wished it had lasted longer! I was so worried before we went that he had outgrown Disney and that he would find it babyish, but how wrong I was! I had him hooked!! The parade was great! I love the Disney parades so much! And I even got to high-five Bullseye! Had such fun dancing along and it was nice to be at the parade start and right at the front near the action. This is one of our videos – brings a smile to my face when I watch it and remember! After the last float went by we quickly moved to Star Tours which was showing a 25 minute wait, not bad, not bad, so joined the line… Disney lied!!! We waited close to an hour…but it was worth the wait. Absolutely AWESOME!!! Love, love, LOVED this ride. We came out and grabbed some fastpasses so that we could ride it again later in the day. Plus size rider guide: Individual seats with a lap seat belt – fine for me. By now (how quickly time flies when you’re having fun!) it was nearing our ADR so we walked back around to Hollywood & Vine to check in. The waiting area outside was ridiculously hot, with metal benches…not a pleasant wait at all I’m afraid to say. We waited around 20 or so minutes before being called in and shown to our table. Noisy and messy was my first impressions. We ordered some drinks and were told to just help ourselves to the buffet, so that’s what we did. The kids choices were nuggets, mac ‘n’ cheese and meatballs. I took some salad as a starter, which was nothing to write home about and then I took some from the kid’s section..this is my mess of a plate with pasta, meatballs and mash *blush* I didn’t want to chance the seafood alfredo which I could see them mixing up behind the counter. From a fussy kid point of view, there isn’t much to choose from – not even fries or plain mash, or even plain pasta…I felt so sorry for my son as he’s a growing lad and can put some food away, but was stuck with a bit of salad and some nuggets. Desserts had a good selection. I had banana cream mousse and Steve took some of the cobbler. Both were okay. I also felt sorry for our debit card when presented with the bill for $121 and really begrudged paying adult price for Liam, especially since it was just a few nuggets and ice cream that he had. With hindsight I should have asked if we could pay the kid’s price, but I didn’t. It was such a disappointing meal for us, that I just wanted to get out of there. The waiter was never any where to be seen to order more drinks, tables around us were left cluttered with dirty dishes for longer than necessary and it just didn’t feel nice in there. He didn’t even explain about the Fantasmic priority seating which we had expected him to do – so all in all, never again for us I’m afraid. We left a tip, but certainly didn’t bother with 18% or 20%. I know that tipping is a big thing over in the states, but so is good service, and for us, this was far from it. I think I would rather queue for Fantasmic than have to endure H&V again…maybe we got a bad day, but even so, I expected more from a Disney restaurant. Shame. Escaped the restaurant and walked via the Sorcerer’s Hat (which I think is very cool) towards Pixar Place. We stopped first to go on The Great Movie Ride which was okay. Liam enjoyed it. Entering Pixar Place, we knew that the queue would be insane for Toy Story Mania and that there would be no more fast passes – we were right both times – 90 minutes and fastpast booth covered over. We shrugged, knowing that we would definitely be coming back, if only to do this to see what the fuss is all about! Taking in all the details, we carried on walking around the park towards Star Tours for our fastpass return time. We got a completely different ride this time around which was unexpected! I wonder how many variations there are? Does anyone know? Up next, my childhood favourites – The Muppets! A great bit of nostalgia for me personally. The theatre was empty so we could sit wherever we liked with no ‘please move to the end of the aisle’ being shouted out by CMs. I thought the Muppet Vision 3D Show was fab! Time was pushing on, so we started to walk to Fantasmic. Trying to find loos and a place to buy a drink, seemed to be a bit of nightmare in this part of the park, and when we located a cart the line was long and there was only one guy serving who was also the slowest server on the planet >_< Considering this cart is next to Fantasmic, I thought that they would have had more than one server. Oh well, we hiked it up to the stadium, grabbed a seat and waited. It was nice to sit down and rest our feet as it was a very rushing about kind of day today. I managed to get a blister on the bottom of my toe…my TOE!?! I’ve never had a blister there in my life – how does that even happen?! Lol. I was prepared though, having brought Compede plasters with me. Night drew in, and Steve commented that he could see lightning in the distance. I said “it’s just the light rigging” and started to panic as I knew the show could be cancelled due to bad weather. We sat watching the skies as the lightning forked in the clouds – it looked very ominous…no announcements were made until 8:59 when they decided to say “due to unforseen circumstances, the show would be delayed” and nothing further. This same announcement continued for 25 minutes. With each announcement and no further information, booing started from the crowd, which I thought was a real shame, and it got louder and louder, people were starting to walk out. I think if they cancelled now there would have been a riot >_> All I was thinking was, I had to sit through that horrid meal for this and now it may be cancelled! Around 9:30 it was good news when they announced the show would be starting shortly, and this was met by thunderous cheers. It was worth the wait – LOVED Fantasmic. I thought it was beautiful and the projecting onto the water was very clever. Tricky for me to get photos of I’m afraid! Amazing show and we got a great view (I thought). I hear that the priority seating thing isn’t that good, but I was happy enough and could see everything. Back to the trams to take us back to our car and home to fall into bed! Along with the Lights, Motors, Action! Extreme Stunt Show, we also missed The Backlot Tour which closed at 7pm. We hadn’t planned to do Tower of Terror or Rock n Rollercoaster (I didn’t even see that ride!) We missed a few other things too…but I knew we would and I also knew it was going to be the park we would do twice – only because of my poor planning when doing the ADR for Fantasmic and the whole car swap thing *slaps head* In my diary I wrote that I didn’t think we did too badly for a half (ish) day at this park and would be fine with a full day – with good planning so you see the shows you want to see. Our plan of action for when we visit Hollywood Studios later in the holiday is for Steve to run for fastpasses for TSM, do Start Tours again (awesome ride – I have to say it again!) and watch all the shows that we missed…I thought the crowds were manageable, even though Touring Plans said it was a park to avoid – and seemed to be the park to avoid on most days when we checked! Hollywood & Vine – never again. But on the whole a great park with a good mix of attractions. Thanks for adding your posts to the BritMums travel linky. Your photographs are fabulous. Must remember your tip of just asking if there are any alternative cars when hiring them abroad. Can’t believe some of the cars we’ve had in the past and we’ve never had the sense to ask what else there is available! Thank you for your kind comments Trish – I just loved taking photos whilst we were on this holiday – and I can’t wait to do it all again in 2013!